Almost twelve months after Greek banks’ capital increases of 8.3 billion euros and six months after the European Central Bank’s comprehensive assessment did not unveil any capital shortfall, capital concerns could emerge again for local lenders. The Financial Times reported last week that the European Union is collecting evidence to determine whether four southern EU countries, namely Greece, Portugal, Spain and Italy, should be investigated for bolstering their banking systems with capital that could be considered state aid. The probe for unfair state aid relates to the deferred tax assets (DTA) that were legislatively converted to deferred tax credit (DTC), strengthening banks’ capital base albeit with low quality capital. For Greek banks in particular, the legal framework that was passed last October, which is similar to that implemented in Portugal, provided for the conversion of DTA to DTC for deferred tax related to PSI losses and accumulated provisions due to credit risk. According to the article 5 of Law 4303/17.10.2014, Greek banks formed a special reserve equal to 100 percent of the DTA converted to DTC, issuing at the same time conversion rights in favour of the Greek state. Each year this reserve will be reduced by the equivalent amount of annual corporate tax. As of 2015, whenever a bank reports a pre-tax loss, a portion of the conversion rights will be exercised into common shares (capital increase) for a total amount resulting from the formula: (DTC over capital) times year’s loss. As an example, if a bank reports a pre-tax loss of 1 billion euros and has a capital base of 10 billion of which 2 billion or 20 percent stems from DTC, then the bank will proceed with a capital increase of 200 million (20 percent of loss) that would be fully covered by the exercise of conversion rights. In their 2014 financial statements, Greek banks reported DTC-eligible DTA of 12.8 billion euros out of a total DTA of 15.6 billion. Of the DTC-eligible amount of 12.8 billion, 5.5 billion stemmed from PSI losses and 7.3 billion from credit risk provisions. 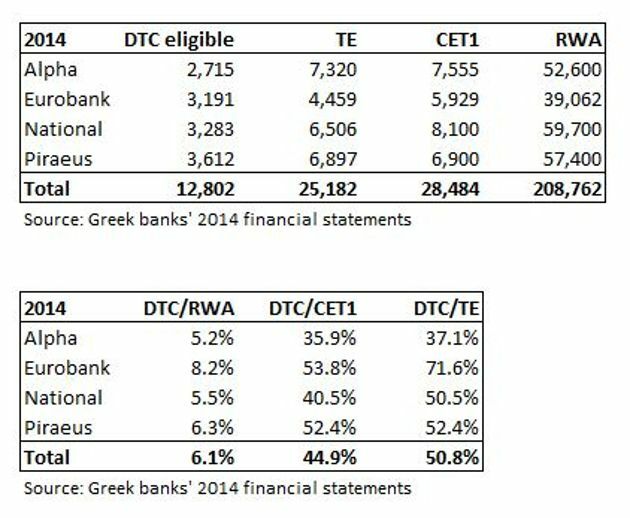 More importantly, the DTC-eligible DTA made up slightly less than half of Greek banks’ common equity Tier 1 (CET1) capital in 2014. In particular, DTC accounted on average for 44.9 percent of CET1 with the ratio ranging from a low of 35.9 percent for Alpha to a high of 53.8 percent for Eurobank. The comparison with the tangible equity (TE) - which also excludes preference shares of 950 million for Eurobank and 1.35 billion for NBG - is even more profound and shows DTC-eligible DTA accounts for 50.8 percent of TE. 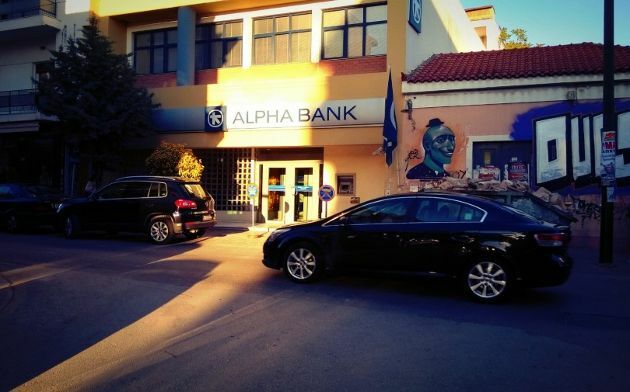 Alpha enjoys the lowest ratio at 37.1 percent, with Eurobank at the high end at 71.6 percent. In 2014, Greek banks recorded Basel III CET1 ratios ranging from 12.1 percent for Piraeus up to 15.2 percent for Eurobank. However, DTC accounted for 6.1 percent of their risk-weighted assets (RWA), from 5.2 percent for Alpha up to 8.2 percent for Eurobank. All those ratios clearly demonstrate the positive impact of DTC-eligible DTA on Greek banks’ capital ratios. Under Basel II rules, DTA will gradually no longer count as bona fide capital for amounts exceeding 10 percent of core capital by 2024. For Greek banks, this means that 2.8 billion euros of the DTC-eligible amount would in any case qualify for CET1, leaving the remaining 10 billion at risk. However, the legal framework for DTA conversion to DTC currently eliminates such possibility. Daniele Nouy, who is chair of the Supervisory Board of the Single Supervisory Mechanism (SSM) at the ECB, told the FT last February that “there were too many national options in the definition of capital across EU and we have to address that.” In addition, the ECB has signalled it would increase capital buffers for banks seen as over-reliant on kinds of capital such as DTC that is not regarded as ‘high-quality’ capital. The sensitivity of Greek banks capital ratios clearly shows that a potential amendment in the conversion of DTA to DTC would pose a significant threat for their capital ratios. In its weekly credit outlook released on April 13, Moody’s noted that the EU review of DTA in regulatory capital is credit negative for Greek banks.